I woke up this morning to one of the best emails EVER. Let me explain - a few weeks ago I went to lunch with a lovely bunch of Canadian quilters who were in town on a quilting tour. I got chatting with a lady who is a rep for Moda. I told her how much I love Bonnie & Camille so I was asking her if she had met them, of course she had and she was seeing them again very soon at Quilt Market which is actually on right now. I gave this lady a copy of the Patchwork and stitching magazine so she could read it on her travels, it just so happened that it was the issue my profile was published in so it was kind of extra special. Anyway we said our goodbyes and I wished her lots of fun at market. This amazing lady took the magazine to quilt market yesterday and had it photographed with the famous Bonnie & Camille. I was so excited. I still can't wipe the smile off my face. So thankyou Noeline you are the best. Its been a funny kind of week, I haven't done alot of sewing as I have spent most of my spare time pattern writing for an upcoming magazine publication so that takes alot of time. I also taught a patchwork class at my favourite quilt shop. I did however find time to whip up this cute pouch. I bought the fabrics on Thursday night after class. I had no intention of buying anything but all night they were staring at me and that cute little deer.... well need I say more. I loved how it turned out. I added a few extra things to make it a but more fun. I like using the fabric tape measure twill. Yesterday after I finished the pouch I was really liking the coral and navy theme so I dug into my stash and found a few navy pieces. I have made a few stars blocks, I think I might make a big cushion cover. Sometimes its nice to sew with fabrics that are a bit out of my comfort zone. I quite like them for a change. So what have you been sewing lately? I've been sewing with a different colour palette today too Leanne! My daughter-in-law wants a peach and pine/sage colour scheme for a baby quilt, with grey too! Navy and coral is a lovely combo, isn't it? 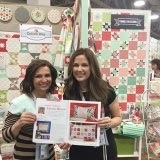 How lovely for you to see your magazine feature at Quilt Market- almost as good as being there! Wow what a blast to see your magazine in the hands of the designers you love, Leanne - woo hoo! Such a huge thrill! Camille is so lovely, and I'm sure her Mum is too.